So I'm super late getting this post out, but better late than never! Our sweet baby girl, Johanna Judith, arrived on January 31, 2019 at 11:31 pm! She weighed 6 lbs 15.8 oz and measured 20 inches long. We are enamored with her and everyone that sees her just can't get over her head full of dark hair!! Her middle name is for my dad's side of the family, after my Aunt Judy, and her first name means gift from God, which she miraculously is! All of the lovely photographs you see here were taken by April Cole Photography--she does amazing work and we love her! I had been having Braxton Hicks contractions for a few weeks prior to getting some different, cramp-like contractions more in the lower back early in the morning on January 31st. At the time of delivery I was 39 weeks and 1 day, and I remember the day before she was born being super emotional. These continued pretty consistently and eventually got stronger, so we headed to the hospital around lunchtime, dropped with girls off with their aunt and uncle, and arrived at labor and delivery around 1 pm. When they checked me I was 3 cm, and they said I could walk halls for a few hours to see how much I was progressing. After walking a while, I was only 3.5 to 4 cm and unfortunately not enough for them to keep and admit me. However, my contractions were getting pretty strong and painful at this point! So, we decided to stick around close to the hospital and drove around for a bit before getting a hotel room so that I could take a warm bath and try to relax while my labor continued. As soon as we checked into the hotel room, I laid down on the bed and had a very strong contraction--and my water broke all over the hotel bed!!! So just as soon as we had settled into the hotel room we had to immediately leave and get back to the hospital. I was still leaking fluid with every contraction in the car, in the wheelchair on the way up labor and delivery, and once I got into the hotel room. My contractions at this point were extremely strong and painful, and close together. We got back to the hospital around 6 pm or so, and I was checked into a room and at that point I was 5 cm dilated. My labor was naturally progressing super fast, and it was at this point I asked for the epidural. I was going to try nitrous oxide gas but things were so intense I just wanted the epidural at that point...haha. In the span of about 20 minutes, I went from 5 cm to 7 cm and probably would have given birth soon, but after getting the epidural my labor slowed down some and I was able to relax a little better. There were a few scary minutes when our baby's heart rate dropped because of the combination of the epidural and the fast dilation, but it came back up quickly. A team of several people came in the room and left just as quickly once the heart rate stabilized. On a side note--although it seems like a good thing to have the attending MFM in your room, it usually means something is going wrong! I was happy to have my sweet resident doctor and nurse back handling my labor for me. The rest of the evening I was lying on my side with a peanut ball in between my legs during labor, which I could still feel, just at a reduced pain intensity level because of the epidural. I did have to get it boosted once as it started to wear off a bit. My contractions remained very close together and strong. Finally at around 11 pm I was fully dilated and it was time to push and Johanna was born 30 minutes later! As soon as I pushed her out they immediately placed her on my chest and finished checking her out while we did skin-to-skin. She stayed there for a few hours before they took her to be weighed, measured, etc. She even tried to nursed some, it was the most amazing bonding experience and I still can't get over how thankful I am to have made it through without any preeclampsia this time, no induction needed, no excessive bleeding, infections, or any other complications. We went home from the hospital not even 48 hours after she was born. I felt pretty well recovered physically and back to normal much, much sooner with this birth. Her big sisters have been great with her and are such good helpers. We all adore her so much! I can't believe we only have a few or so weeks until our baby arrives! It really has gone by so fast this time around--having twin 5 year olds sure does keep one busy and occupied. Still, we have managed to find time to prepare for this new little one in the most basic ways. I thought I would share with you all the ways we have prepared (early on) for the new baby in our house. 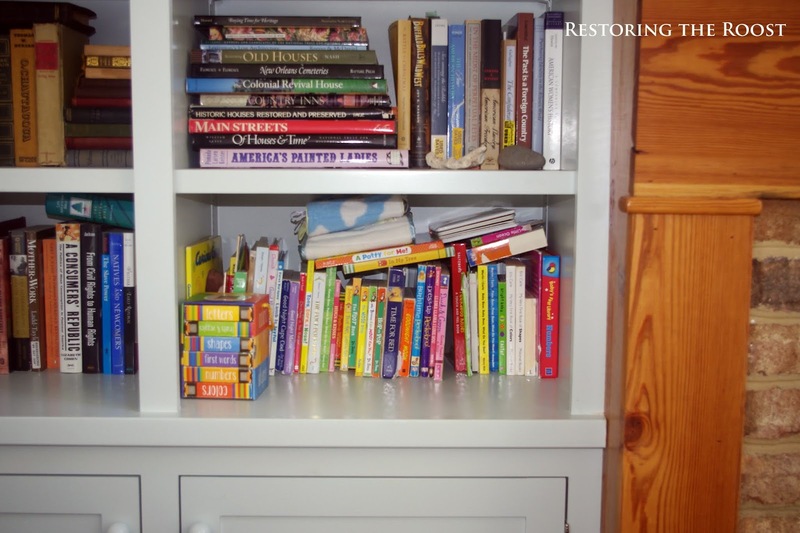 I hope this may help some readers out there who are wondering what and when to do the things for preparation of a new little one when you already have young children and most of what you need. 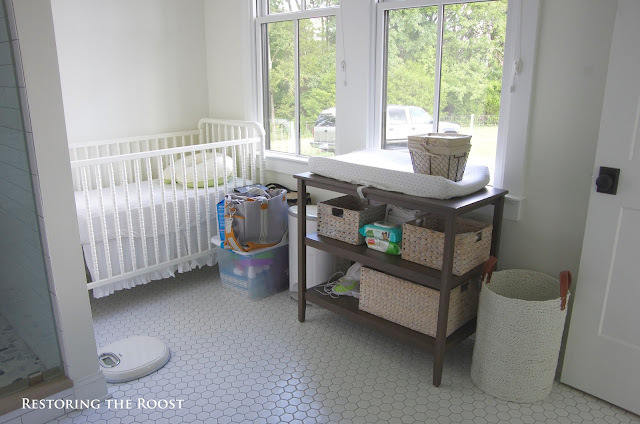 Since we are keeping the baby in our master bathroom (attached to our bedroom) likely for the first six months to one year, we didn't have to worry about a "proper" nursery. 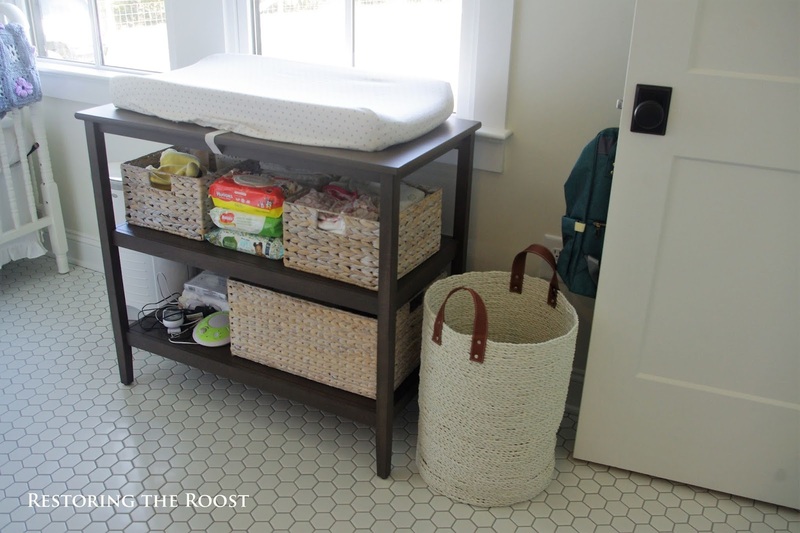 We simply set up the crib, changing table, diaper pail and hamper in the area where a bathtub would normally go (but we had left empty). 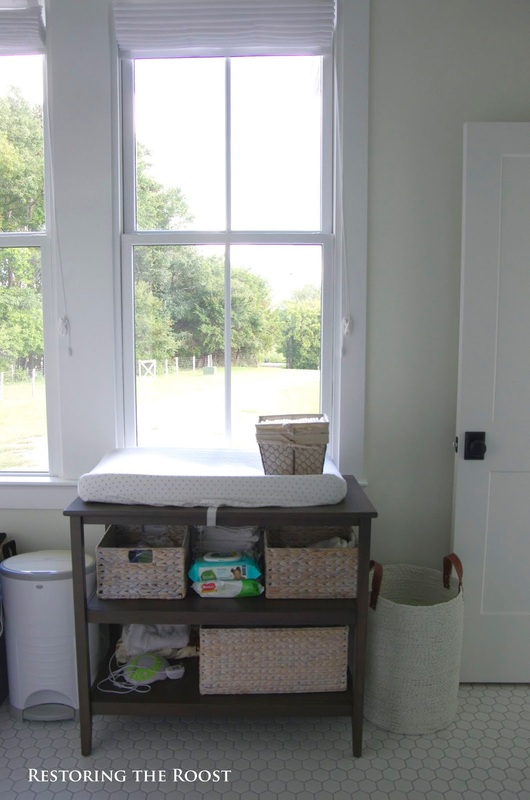 My mom got me this wonderful changing table on sale from Pottery Barn that can double as shelving for when the baby gets a little older. I outfitted it with some baskets from HomeGoods to hold things like diaper changing necessities, clothes, blankets and extra crib sheets, wipes, and many other things. The crib fits perfectly in this little nook beside our shower. On the wall I hung some baskets that we used in the girls' nursery to hold diapers so they are within easy reach. The hamper is also new from HomeGoods. Upstairs in our guest bedroom (we aren't sure where the baby's room will end up being yet), we have added the baby armoire and stocked it with most of what we already had on hand in terms of blankets, crib sheets, clothes, bibs, socks, and any other baby necessity that would normally fit in a dresser. I started early in the second trimester pulling everything out of the attic, sorting through it, washing anything that could be washed and putting it away. I organized and cleaned anything we had saved that we could reuse for this baby, including things like breast pump containers, bottles and feeding supplies, baby seats and carriers, and baby toys and books. Each week I did a little bit more until most of the work was completed. I don't like to procrastinate, and I decided it would be better to go ahead and get as much as I possibly could done when I was still feeling up to it rather than wait until late in the third trimester when I may not be feeling so great. 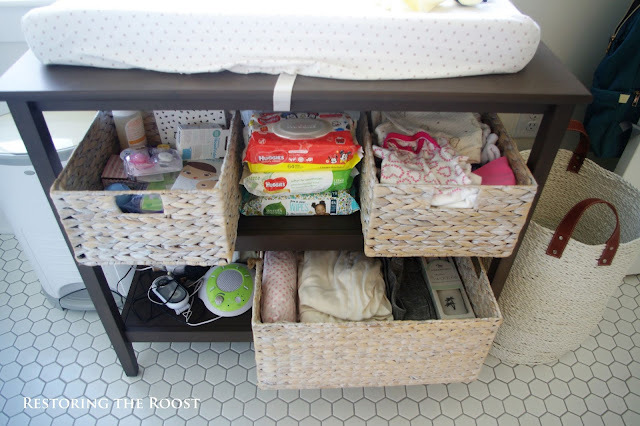 Next I began making a list of things that we would need new and I created a small Amazon baby registry. 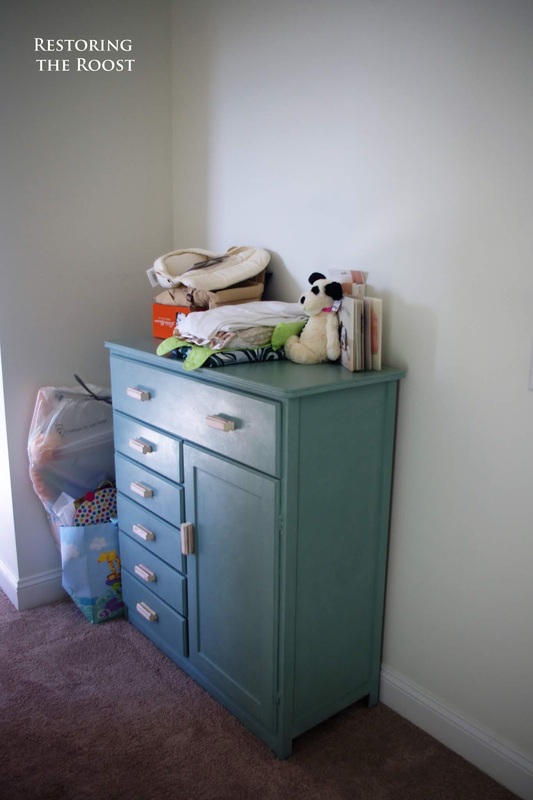 Some things we added we did not have for the girls and we decided would be nice to have for this baby, and other things we needed new of that we had either lost or needed to replace. 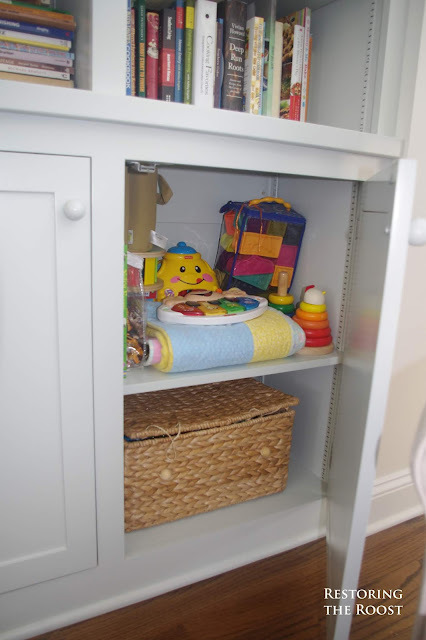 In our living room, I cleared out a bookshelf to house baby books and used one of our cabinets to hold baby toys since the baby will probably be playing downstairs quite a bit the first year. In our bedroom, we moved the glider from upstairs to a corner in our bedroom and replaced where it was in the girls' room with another armchair. 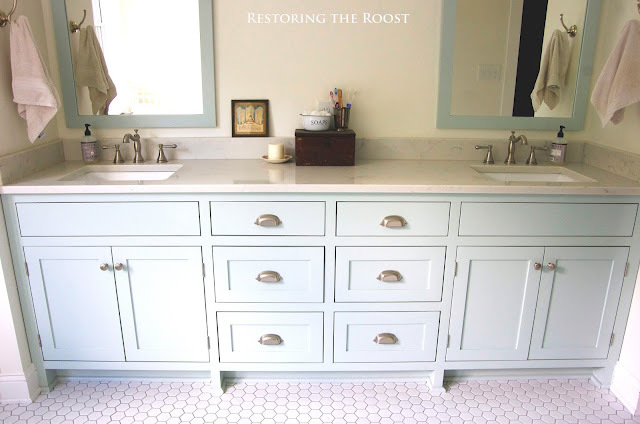 On to the master bathroom tour! Perhaps the most "improved" room from what we had in our old house. We actually have a much larger amount of space, a much improved shower (no more slipping in the claw foot tub! 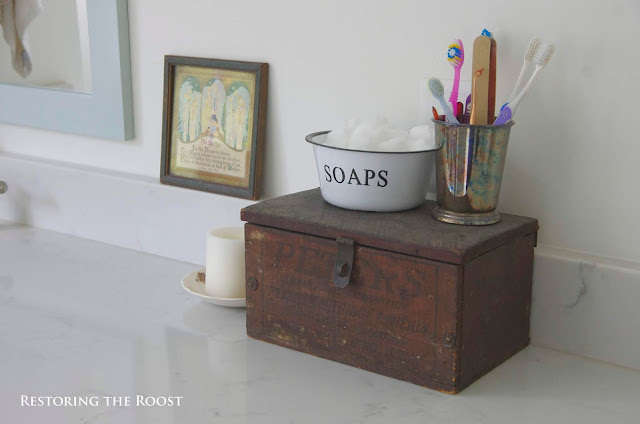 ), ample counter space and storage, and a lovely tile floor that won't warp if it gets wet. 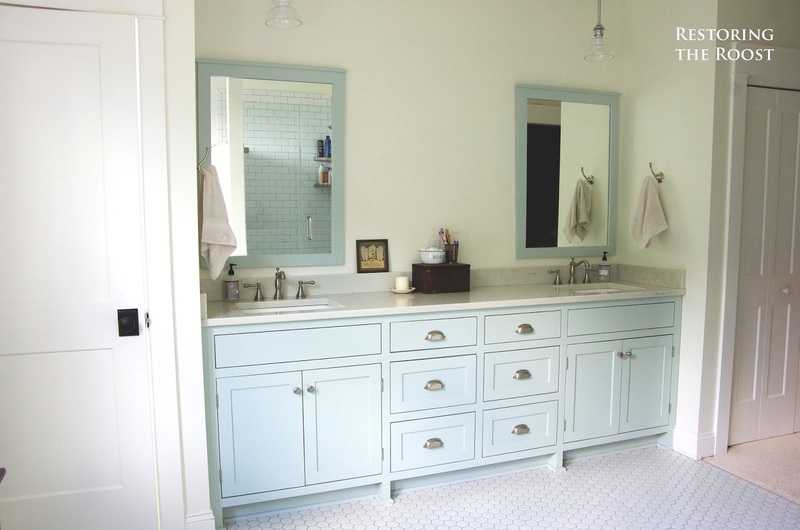 We designed the master bathroom with a double sinks and plenty of cabinetry. It is glorious. The countertops are quartz, although I will say they look and feel just like marble! 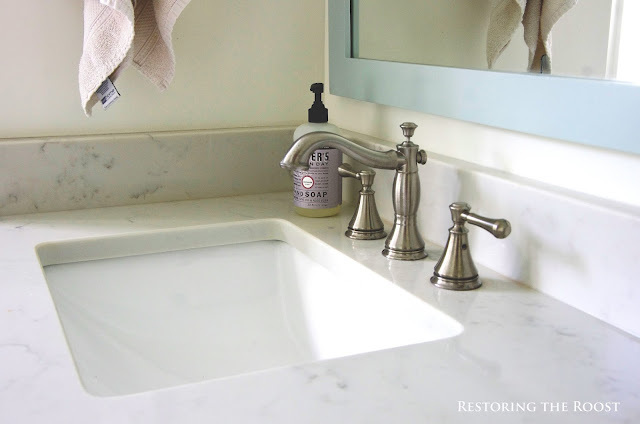 Sink faucets are brushed nickel and so is the cabinet hardware. The cabinets themselves are painted "rainwashed" by Sherwin Williams, a lovely shade of light blue-green. 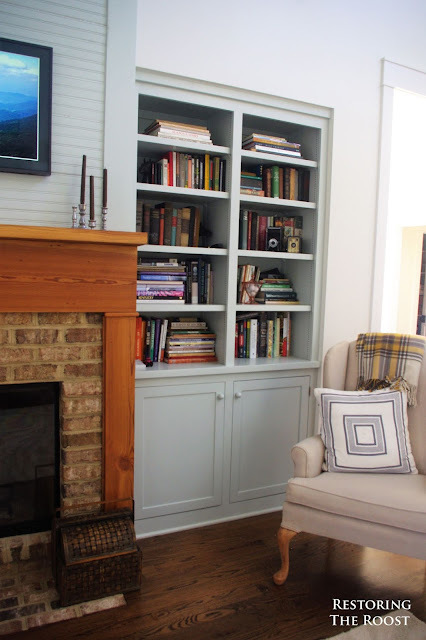 With so much white, I wanted a little pop of color. Two pendant light fixtures with clear glass shades illuminate the bathroom vanity. 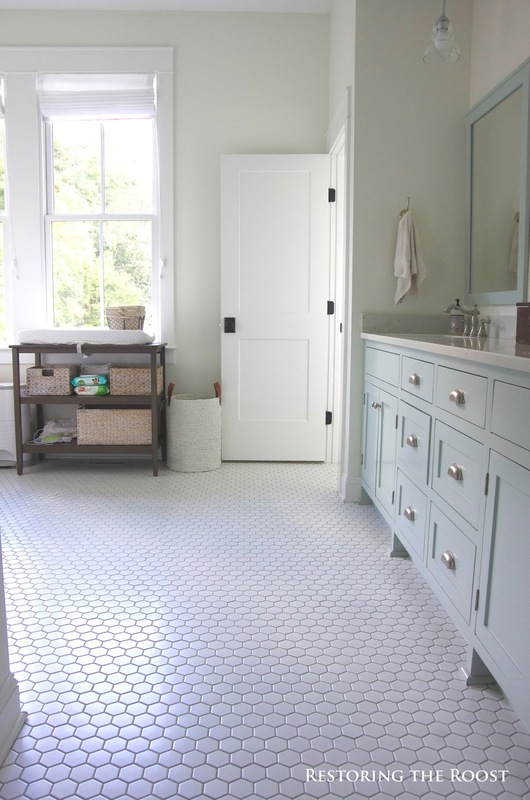 The floor is a simple porcelain white hex tile with grey grout. I really love it. We designed a walk-in shower with glass doors and white subway tile walls. 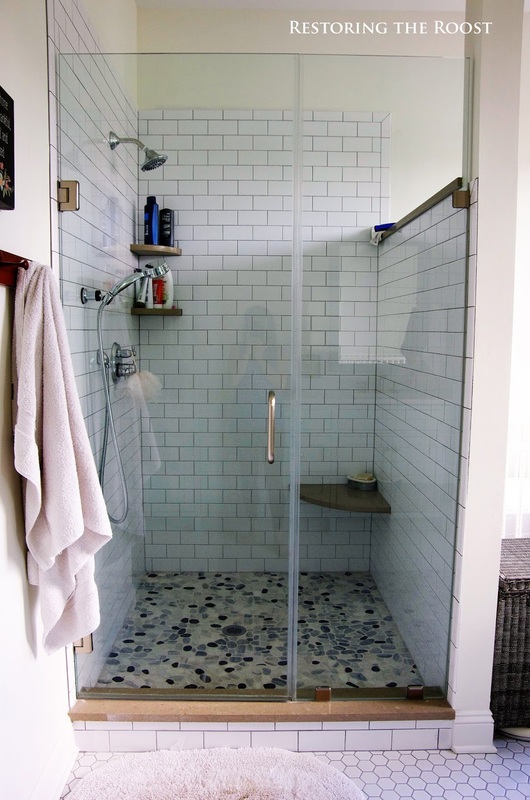 The shower floor is a multi-colored "pebble" floor that is available at most tile shops now. 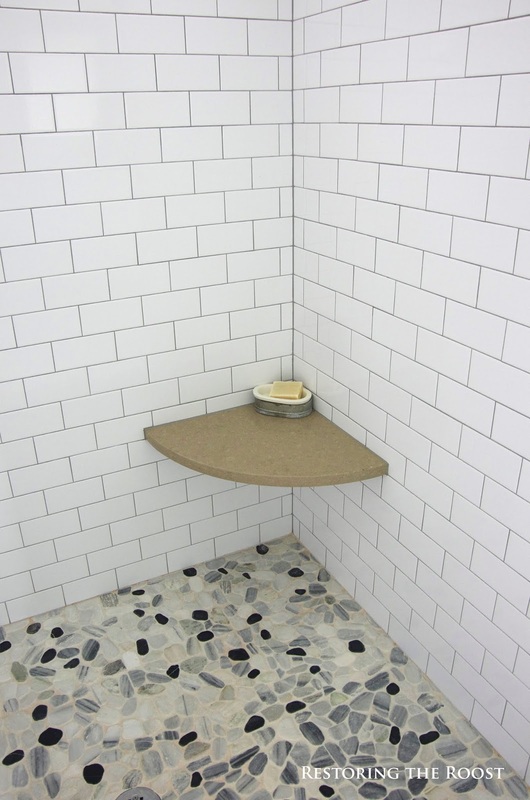 The shower walls have grey grout and grey rounded corner shelves for toiletries and a little shower seat. 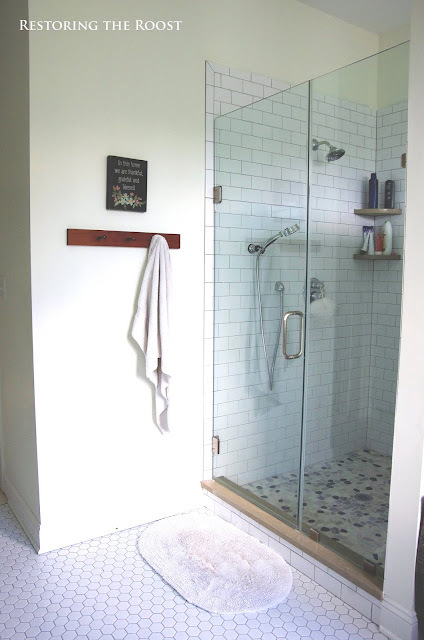 One thing I am so glad we decided to include was the extra shower sprayer that detaches from the wall--we have used this so much and it also can double as an additional shower head and is perfect for cleaning. 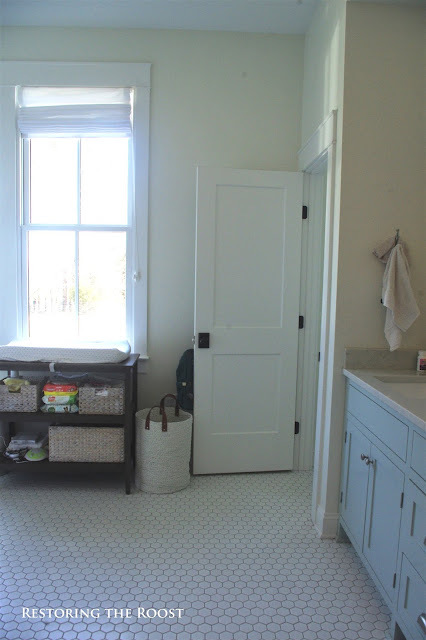 A shaker-peg rack hangs on the wall for towels within easy reach of the shower. 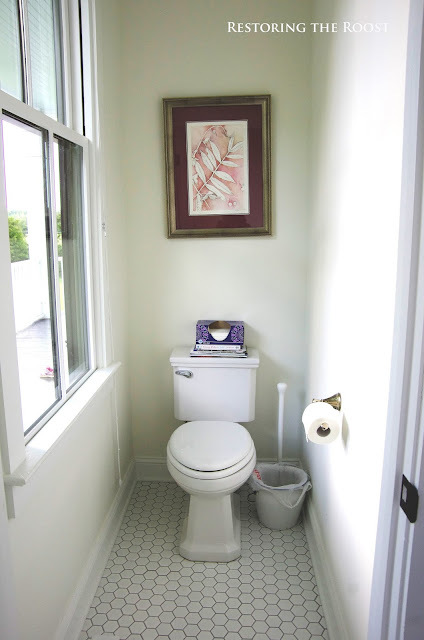 Our "water closet" holds the toilet which is nice when we want a little privacy using the bathroom and others are using the sinks or getting ready. The master bath is quite large because we waited on putting in a bathtub to save a bit on costs. Thus, we have a lot of extra space which we have utilized for several things since moving in--random storage, a little indoor space for growing our seedlings under the grow lights, and most recently, we are using it for a nursery for our newest addition due in late January. Yes, you heard right--the nursery is in our master bathroom! 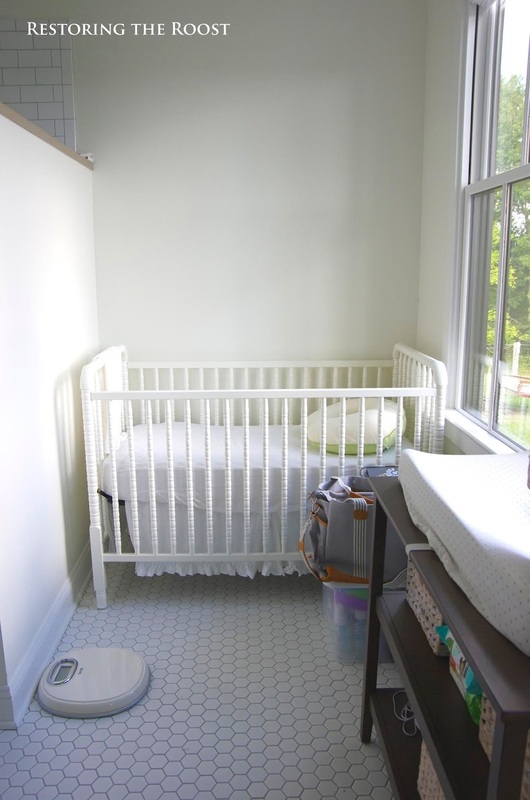 A bit crazy, I know--but a crib and a changing table fit perfectly in there and with it being directly off (connected to) our bedroom, I'm hoping it will be a perfect spot for the baby for the first year. Poor third kid, haha! We will eventually move the baby upstairs to its own bedroom at some point (not sure which one this will be), but for now this works for us without us having to go up and down stairs constantly. 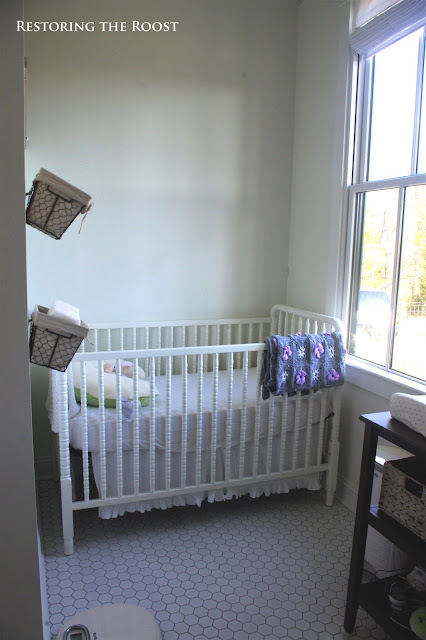 I'm planning on putting the rocker/glider in our bedroom for rocking to sleep and we have the baby's little armoire that was mine and that we used for the girls currently upstairs. Our parents joke that if the baby has a blow out or spit up mess, we can just walk with her right into the shower and hose her off. 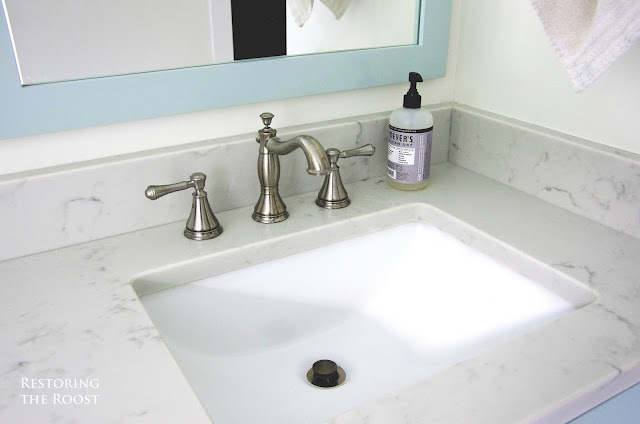 It will also be convenient to be able to wash my hands at the sink right there too! 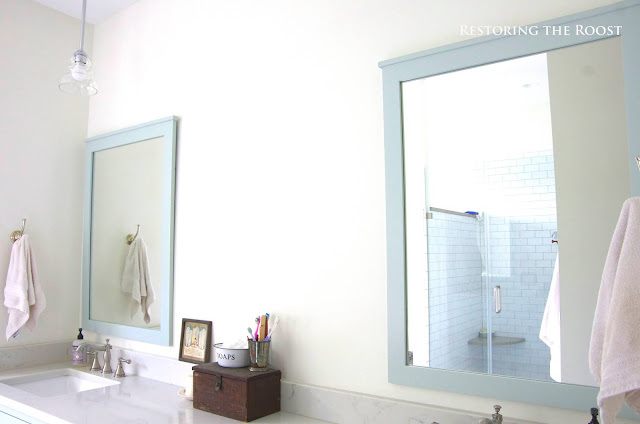 One other thing--we have three large windows in our master bathroom that face the front yard. Although I hated to put window treatments on these beauties and I love all the light it brings, it was necessary to have some sort of treatment that we could pull down when we needed privacy and especially for the toilet area. I ordered simple, white Roman shades from Blinds.com and they turned out to be perfect for what we needed. Simple and neutral, they still let in a lot of light even when they are let down. Hope you enjoyed the tour and stay tuned for more upcoming room tours!